A lot of people ask me about my daily habits. 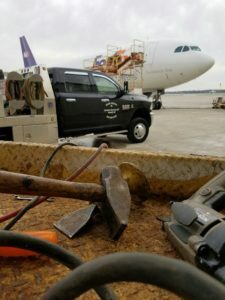 What's the routine of a person who is both business manager and bulk of the work crew? How do you balance, business, project workload, equipment maintenance, and family? I'll be the first to say that some days it isn't easy, but it does bring a lot of gratification. It's really nice to see everything it takes to make projects happen day after day, to see a customer smile and then say "I did that!" Talent alone doesn't make this happen, and quite often there's conflict of priorities that could easily bring the whole process down. Without a clear head and a focus on long term goals, a person could easily end up spinning the business out of control. If you go through the listings on Amazon and look at practically all of the business blogs around the internet, you'll see a lot of focus on what habits that people seen as successful have. What do they all have in common? Is there a recipe for a successful person? I'd say "partially." As you read through all of these accounts of what successful people are like, probably the biggest common denominator is that they're resilient and dedicated. Otherwise, their habits are mostly all over the map. Some get up at 3 am, read the morning paper, work out, spend time focusing on the day, and then jump in! Others seem to sleep until 10 am, lollygag until noon, and then seeemingly "wing it" through the rest of the day. For me, I get up early and focus on getting my mind and body ready for the day. I get up before anyone else in the house so that I can get a plan together and get focused. I do a little bookkeeping, return a few hundred emails, and schedule work that hasn't been scheduled. I order materials, quote jobs, and get everything out of the way that I can. Once this is done I can focus on the work for the day and minimize interruptions. If I don't do this every day, whether we're open for business or not, then the rest of the day is guaranteed to be one form of chaos or another. During the course of the day I constantly account for time and materials so I don't have to do it later. I invoice for projects as they're completed so none are left out. I tie up every loose end I can, on the fly, so I don't have to revisit it. Revisiting issues is extremely expensive, and literally means the difference between profit and loss for any given day. I have bad habits too. One of them is that I don't take breaks. Most of the time I don't even take lunch, or at least not at lunchtime. It's important for me to stay focused. If I stop for a break then the focus is lost. Of course, as owner/manager of a business, I do need to break for the occasional phone call, but I usually try to save as many as possible for when a stopping point makes sense. Some customers don't like this, but then they're usually amazed when I return their call and let them know their problems are well taken care of. One other thing that isn't politically correct in the business world, is that I focus on dedicated "down time" with my wife. Without a good marriage, this business would be in shambles. Tammy is very supportive of Amerivet Services and the effort I have to put in during the week. When the weekend rolls around, she's also very appreciative of the time I spend working on "our" projects, catching up with our busy lives, and relaxing together. We take weekends and holidays "off" so that we can focus on enjoying the fruits of our labor. We make long holiday weekends even longer where possible, and have created a tradition of making Independence Day a 5 day celebration for friends and family. While running a business requires a lot of long, busy days, it's important to create the right routines that help you focus on your core customers. You have to create habits that allow you to take care of yourself and stay focused on long and short term goals. You have to take care of yourself mentally and physically, because if you're down because of an illness or injury you'll notice the difference in your checking account very quickly. One other habit for you to have, is to call Amerivet Services when you have a problem. When we take problems on, we take the load off your shoulders and find permanent solutions. I'm thinking my next blog entry should be about how temporary fixes are always permanent, so it's better to just do things right the first time. More to come on that. For our parting shot, check out one of the cool places I get to work!